For all your working needs. The N-Series provide superb value and the reliable business-grade performance demanded by professionals. Dimensions (H x W x D) 12" x 4" x 16.25" Dimensions (H x W x D) 12" x 4" x 16.25" Dimensions (H x W x D) 12.00" x 4.00" x 16.25" Dimensions (H x W x D) 12.00" x 4.00" x 16.25" Dimensions (H x W x D) 12" x 4" x 16.25" Dimensions (H x W x D) 12" x 4" x 16.25" Dimensions (H x W x D) 12" x 4" x 16.25" Dimensions (H x W x D) 12" x 4" x 16.25" Dimensions (H x W x D) 12" x 4" x 16.25" Dimensions (H x W x D) 12" x 4" x 16.25" Dimensions (H x W x D) 12.00" x 4.00" x 16.25" Dimensions (H x W x D) 12.00" x 4.00" x 16.25"
Packaged in a slim case for minimal desk space usage, ABS desktops provide superb value and the reliable, business-grade performance demanded by professionals. The 4th Generation Intel Core Processor with Integrated Graphics and premium high-speed memory multitask business applications with ease. Combined with the swiftness of a leading SSD, the communications speed of gigabit Ethernet, and peripherals connected using a screaming USB 3.0 interface, this desktop will ensure you and your team can transact business at peak productivity. All storage is optimized for speed with the latest SATA III interface. Running at 6 Gbps-above the upper limit for many mechanical hard disks-data transfers are lightning fast with the top-rated SSD that comes standard. Built to last through 40 GB of daily writes for ten years, the SSD also ensures your start-ups and applications zip along while power consumption and heat is significantly reduced compared to traditional hard disks. Fast as it is, it will never overheat the system with its Dynamic Thermal Guard Protection. Up to two displays are supported with the availability of DVI, D-Sub, and HDMI connections. Everyone will keep focused on the work at hand with the stunning dual-display visuals supported by Intel Integrated Graphics. 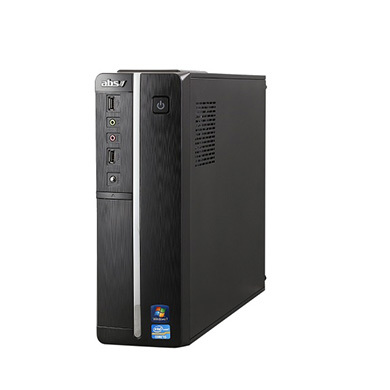 Your organization intends to do business and so does this PC. Choose between pre-activated Windows® 7 Professional (includes a free Windows 10 Pro upgrade), or pre-installed Windows 10 Pro. With Windows 10 Pro, you’ll have the most current and requested business-oriented features and security. This latest version of Windows provides fast start-ups, Bitlocker® encryption, and remote log on. Cortana, the latest Microsoft® personal digital assistant, is there to help you get business done faster. Collaborate and share data efficiently with colleagues across your organization with fast connectivity and communications using native USB 2.0 and 3.0 ports, gigabit Ethernet, and optional wireless networking. All components are manufactured under environmental certifications such as ISO 14001:2004 and the California Electronic Waste Recycling Act of 2003. A full three-year warranty with remote technical support for the first 90 days provided through our own trained technicians remotely assisting directly on your desktop. ©1990-2015 ABS Computer Technologies Inc.